Names are sometimes repeated in a family generation after generation. In my family, Pearl is one such name. My grandmother, Pearl Doris Reed Cleage, was the first Pearl. She was born in Lebanon, KY in 1886, the youngest of 8 children. Pearl Losin Mullins was the son of Pearl’s sister Minnie Mullins. He was born in 1908 in Indianapolis, IN. and died in 1986 in California. Theresa Pearl Averette, was the youngest daughter of Pearl’s brother Hugh. She was born in 1913 in Indianapolis, IN. and died in 1941 in California. Barbara Pearl Cleage, daughter of Pearl was born in 1920 in Detroit, MI. Pearl Michelle Cleage, my sister, daughter of Pearl’s oldest son Albert and 2nd granddaughter was born in Springfield, MA in 1948. Anna Pearl Shreve is my grandmother’s youngest daughter’s daughter. She was born in 1960 in Detroit, MI. 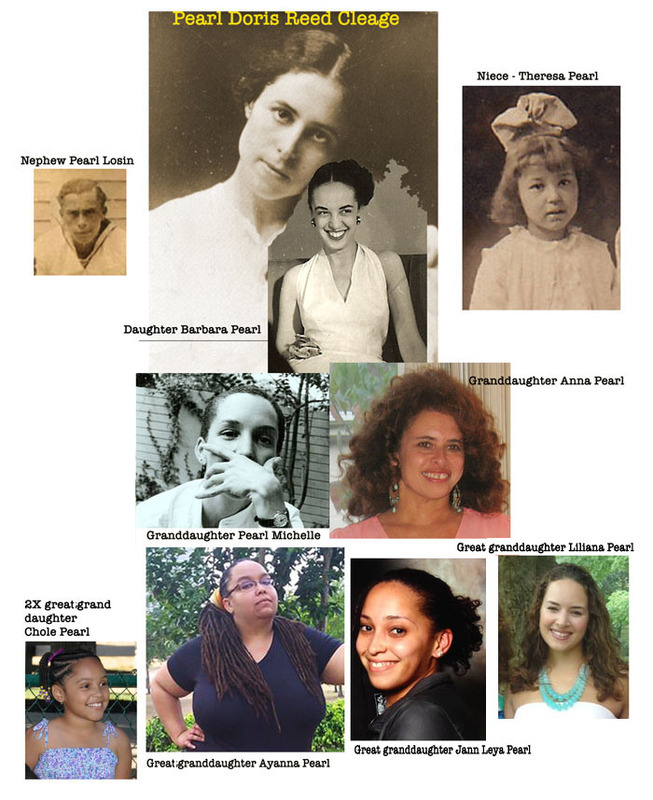 Anna Pearl was the 4th granddaughter. Ayanna Pearl, my daughter and my grandmother Pearl’s great granddaughter, was born in 1976 in Jackson, MS.
Jann Leya Pearl, great granddaughter of Pearl Reed Cleage, was born in 1983 in the Detroit area. Liliana Pearl Nowaczewski, is another great granddaughter of the original Pearl. She was born in 1989 in Michigan. Chole Pearl is the youngest family Pearl. She was born in 2003 in New Orleans, LA and is a great great granddaughter of Pearl Reed Cleage. I love the tradition of a family name. Mary and Alice were the generational names in my family. The Pearls are lovely. I’m going to do Anna and Marie this month too. Hmmm, I think I have Anna on both my mother’s and father’s side of the family, now that I think about it. Pearl……Everyone Woman should have one. Great Post! Beautiful Pearl’s! What a beautiful name to have shared by so many. Lovely post! I just LOVE IT…keeping that name Pearl going is so precious. My paternal grandfather’s grandmother’s name, Mary Jane, kept going for several generations too. I like it too. Wish more would use a family name as part of the name. We should compare notes. I wrote about my great grandmother Anna Allen Reed in a previous post. I don’t know if I did one on the whole family there yet. I will have to check. Thank you for taking it down. I appreciate it. the link back would have been fine, it if you had also given credit to my blog by name.